I invited guests for dinner, without realizing that I would get home about half an hour before. I needed a super fast dessert. This fit the bill. 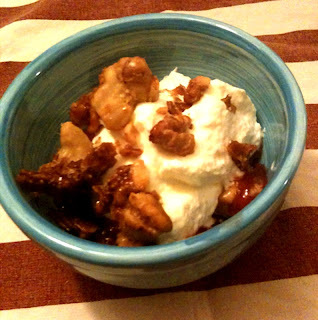 Vanilla roasted plums from the freezer with whipped cream and crunchy walnut topping. For a fast dessert, what a great flavor combination! I not only love it but think I will give this a try over the weekend.